In all editions of ELMA (Community, Express, Standard, Enterprise) it is possible to translate the system interface into almost any foreign language (from the list of .NET platform languages). To make the translation function available to a user, go to Administration – Users – Access Settings – Global Access Settings – Administration – Translate ELMA and assign this permission to the required user group (fig. 1). After assigning permissions, the selected user groups will be able to use the Translation Mode button in the user menu (fig. 2). via PoEditor – in this mode, all lexical units used in ELMA are translated. When you click on the Translation Mode button in the user menu, all the elements of the page that are available for translation will be highlighted in green and will be translated into English by default, and at the top of the page you will see the language selection panel on which you need to select the language required for translation (fig. 3). To add a new translation language, in the top translation bar > click the button > a dialog box will open. Select a new language from the dropdown list (fig. 4). Once a new language is selected, translate all the page elements. To do this, move the mouse cursor over an element and click on the Translate button (fig. 5) or the Translate tooltip. In the dialog box that opens, in the Translated string field, enter a translation for the selected element. To save the translation, click the Save button (fig. 6). After saving, the entered translation will be displayed for the selected page element (fig. 7). If the Translation String is empty, after clicking the Save button the selected element will be highlighted with a red frame and displayed in the source language (fig. 8). Along with the above translation option, there is a possibility to translate all lexical units of ELMA. Translation, as well as viewing/filtering lexical units, are carried out in the PoEditor section (fig. 9). To go to this section (fig. 9), you need to click on the button in the top menu of the translation panel. This section displays the form for searching/filtering terms (lexical units), as well as a table with a list of lexical units and corresponding translation. 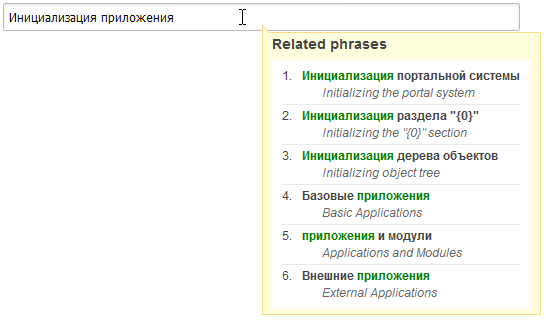 When you click on the lexical unit that requires translation, the form opens (fig. 10). In this form, in the Target field, enter its translation. When you hover your mouse over the term, a pop-up window is displayed (fig. 11) with a list of similar phrases from your translation memory. Below the translated lexical unit, there are Fuzzy and Low Priority checkboxes, allowing you to set the appropriate filtering characteristics for the current lexical unit. The translation is saved automatically and the field is collapsed when you remove the text cursor from the filled field. — Use this button to download archive with language settings. Select the required language from the dropdown list (fig. 12), and click the Download button. The archive with the selected language settings will be downloaded to the PC. — Use this button to upload the file (project) with language settings. This feature is designed to export/import translation templates from one configuration to another (for example, from the test configuration to the production one). Select the required language from the dropdown list (fig. 13), and attach the archive with the language settings, then click on the Upload button. The archive with the selected language settings will be uploaded to the server. — Use this button to publish a new language project. In the dialog box that opens (fig.14) select the required language and click Publish. Once the language is published, all ELMA users will be able to select this language as the interface language. — Shows statistics on translated language files. Clicking on this button opens a dialog box (fig. 15) with general statistics and statistics on files. The translation function is not available if you use web farms.